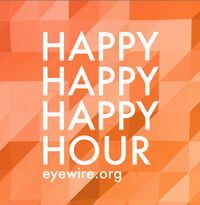 Through EyeWire, the general public can get involved in our research. We offer competitions about once a week where you can earn more points while still helping to map the retinal connectome. EyeWire challenges have varied; many are points-based, but some are cube-based, and some are even accuracy-based. For an accuracy based challenge the person with the highest average percentage correct is awarded the victory. Points are deducted for incorrectness. Also every Friday between 2 and 4 pm eastern time, Happy Hours are hosted. The goal of Happy Hour is to earn as many points as possible. When a certain point threshold is reached, you will earn a bonus. These bonuses stack and are awarded after the Happy Hour has finished. crazyman4865's crazybot is used to track the points earned by the players. Occasionally, when it's a holiday, someone's birthday, or some other time for celebration, a spontaneous Happy Hour will be held with it's own rules. 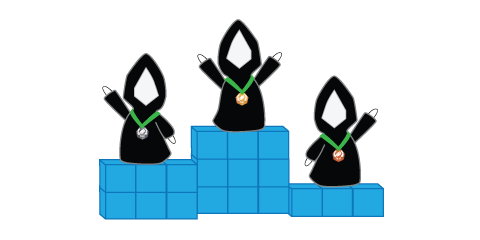 In February of 2014, EyeWire held it's very own Winter Games, to celebrate the 2014 Winter Olympics in Sochi, Russia. Many of these challenges will be repeated for fun at random points throughout the year. One of the GrimReaper's favorite events, The Hunt, was held during the Winter Games. A hunt is when the GrimReaper creates mergers in cell for the players to find, but some are very tricky to find. But when hunting one must be careful, for everyone has a limited number of guesses. One of the games that was introduced during the Winter Games was the Marathon. The players were challenged to complete an entire cell in just 26.2 hours! This game has become widely popular and different variations on it have been held since then. While most of the challenges had to do with tracing cubes, one did not. A chat bot, Inquizitor, was created to hold EyeWire Trivia! In trivia, points are awarded for correct answers, but you have to be quick, because more points are awarded if you answer first. By far the evilest challenge of them all was the Evil Cube Challenge. For this challenge 10 of the GrimReaper's hardest cubes were chosen and given to players, and the players had to trace them as best as they could. In May of 2014, EyeWire HQ released a new way for teams of people to compete against each other. The developers had created a way for EyeWire players to join a team and then the teams points would be tracked in a separate leaderboard! This system is highly effective and fun! The Crazyman Challenge started because EyeWire user crazyman4865, the then all-time high-score record holder, was challenged by other EyeWire users. In a valiant attempt, Crazyman was defeated by a5hm0r, forcing him to relinquish his title. This challenge was entirely points-based and spontaneous. For spontaneous challenges like this, one can either nominate themselves or be challenged by other users. If you think you've got what it takes, and your points record shows it, give a spontaneous challenge a try. This page was last modified on 17 November 2015, at 16:03.